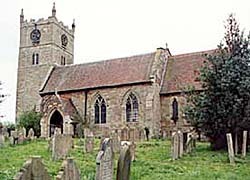 Church of St Andrew, Eakring. The west tower dates from the 13th century, though the top stage is late medieval. The chancel was built in the early 14th century: the church was extensively restored by J P St Aubyn, 1880-1. (Photo: A Nicholson, 2002). The next village to Bilsthorpe standing in this pleasant part of Nottinghamshire is Eakring, spelt in Doomsday Book Echering. One of the early owners of Eakring was Gilbert de Gant, a grandson of the De Gant who accompanied the Conqueror in his invasion of this kingdom. It was Gilbert de Gant who, in 1148, founded Rufford Abbey, and endowed it with his property in this village. William de Albini, whose family subsequently became Earls of Arundel, was also the owner of land at Eakring, and became a benefactor of Rufford. In process of time the manor fell into the possession of Roger, Earl of Rutland, from whom it passed to the Earl of Kingston, the portion of the property vested in the monastery going with Rufford from the Earl of Shrewsbury to Lord Halifax. 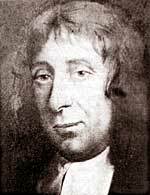 William Mompesson, Rector of Eyam from 1664 to 1670 and of Eakring from 1671 to 1709.